Hearty sandwiches ingredients demand a thick-sliced bread. 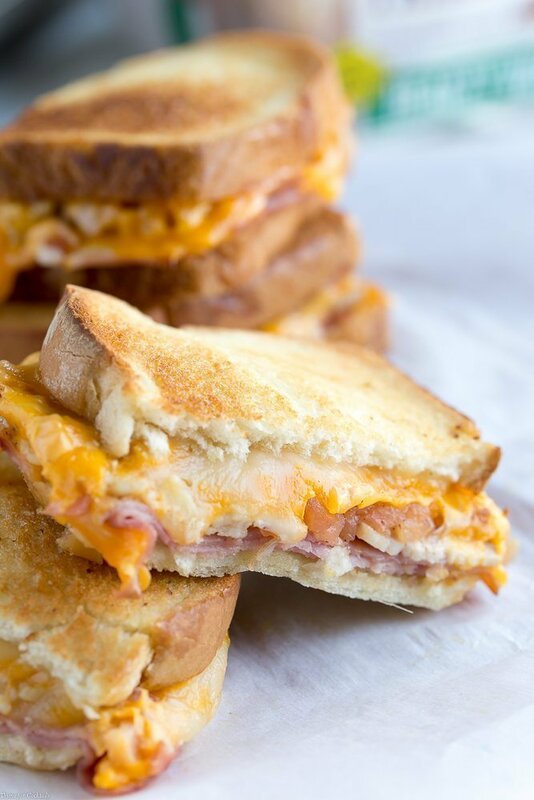 Pepperidge Farm Farmhouse® Hearty White Bread is perfect for the layers of hearty goodness in these Baked Cheesy Ham Melts. The Apple Chutney pairs deliciously with smoky deli ham, spicy mustard, and sliced, tender pork loin. Two different kinds of cheese makes them extra melty too! Sandwich bread is one thing we are really picky about around here. From Saturday morning breakfast toasts to late night grilled cheese we can’t get enough of Farmhouse Hearty White Bread‘s fresh from the oven taste. Best of all you won’t find high fructose corn syrup or colors or flavors from artificial sources in the ingredient list. We love the new and improved taste too! Pork and apple go so well together it seemed a shame not to add a layer of my homemade Apple Chutney to these Baked Cheesy Ham Melts. 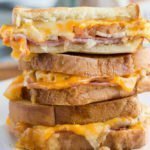 Feel free to make these sandwiches on the stove top in a skillet, but baking them is so much easier. Especially if you are feeding a crowd. Best of all you can make them a day or two ahead of time. Just pop them in the oven when it’s time for a sweet, salty, and cheesy treat! 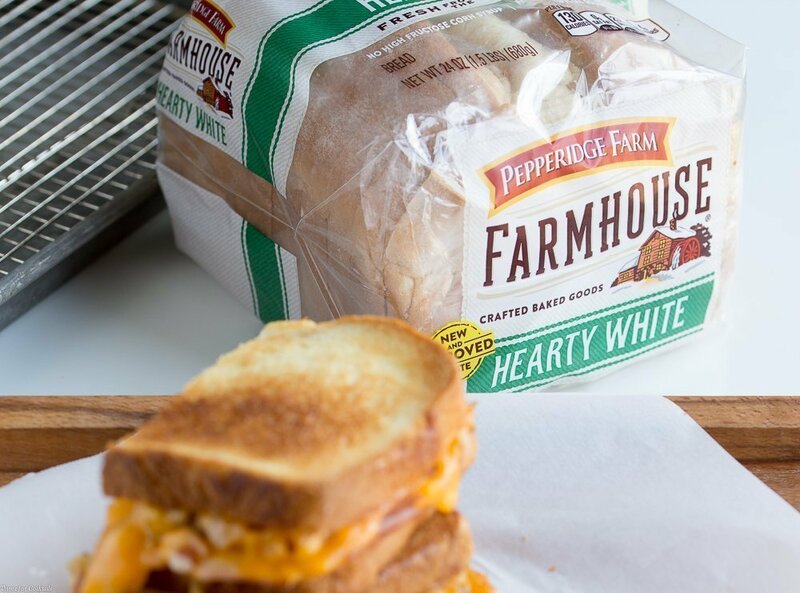 What favorite sandwich are you going to make with thick-slicked Pepperidge Farm Farmhouse® Hearty White Bread? I hope you like our Baked Cheesy Ham Melts with Apple Chutney as much as my crew does. 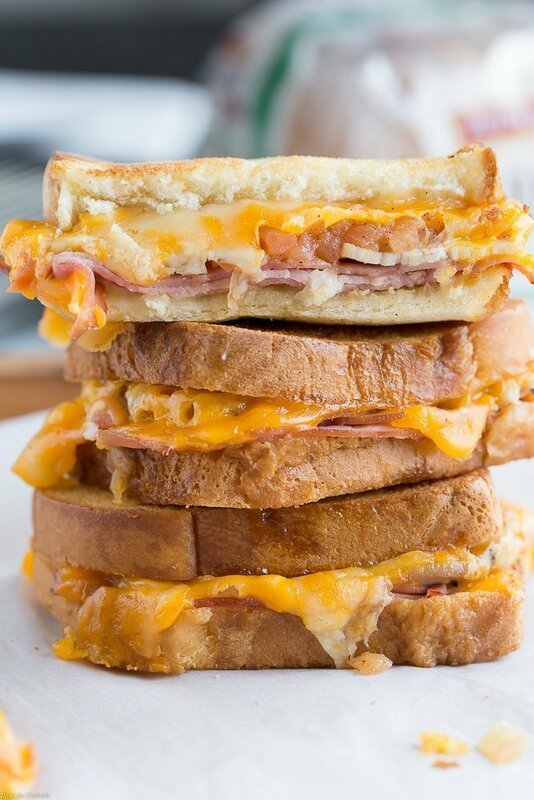 If you love this delicious sandwich recipe, you can find more like it by checking out my Lunch recipes! For recipe inspiration delivered to your inbox, subscribe to my newsletter, follow my photography journey on Instagram, and for generally inappropriate humor follow like me on Facebook! Melt 2 tablespoons butter in a medium saucepan over medium heat. Add apples, brown sugar, lemon juice, cinnamon, and ginger. Bring to a low boil. Reduce heat and simmer 7-8 minutes. Remove from heat and cool. Spread 1/4 of the remaining butter on one side of a piece of bread. Repeat with remaining bread slices. Spread mustard on the unbuttered side of 2 pieces of bread. Layer 1/2 of ham, pork loin, desired amount of apple chutney, and both cheeses on mustard side of bread. Top with a buttered piece of bread, butter side out. Repeat with second sandwich. Wrap sandwiches in aluminum foil. Bake 20 minutes until cheese is melted and bread is toasted. Tip- For an extra crispy ham melt place unwrapped sandwiches under broiler for 1 minute to toast bread.